Who can resist a little girl, three and a half years old, crying over the phone about her lost hat? My little cousin Sarit, for whom I knit the original lilac Odessa, has lost her hat. Devastation ensued, followed by a meek request for another hat from her older cousin. I briefly contemplated knitting another Odessa, but considering that I’ve already knit two, I decided to go with something else. There were only two requirements – it had to come out as special as her older sister’s hat, and it had to have beads, which apparently Sarit and her mom both loved. Pattern: my own (I haven’t yet decided whether I’ll write it up – it’s terribly out of season). 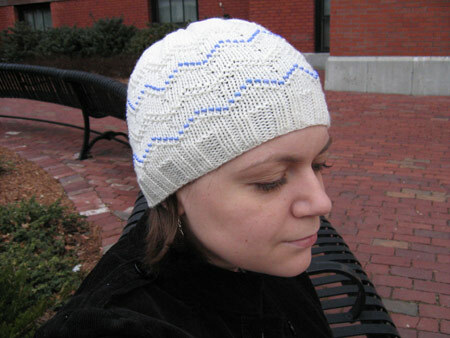 This is a simple stockinette hat accented with a bead and purl motif. I improvised a new-to-me shaping at the top: gathered and ruched. I really like it! Yarn: Debbie Bliss Baby Cashmerino, color 101, off white, 1 skein. Beads: 208 size 6/0 beads. Needles: US 4 circulars and dpns, US 3 circulars for the ribbing. Gauge and finished size: 17” in circumference and 6.75” in depth unstretched (for myself, I’d make the hat slightly wider and deeper). Gauge: in pattern, 24 sts and 34 rounds per 4” square. I’ll mail it tomorrow, and hope the little cutiepie likes it! Lovely! Please write this up if you have a chance – it would make a wonderful chemo hat year round. I love the bead pattern on this one! Poor little Sarit, losing her hat. 🙁 I was devatated when I lost my bear hat and I’m a lot older than her! Oh, the whole family will love it! very cute! the blue beads are a nice accent. It is very cute. I’m sure she will love it. Given the temperatures right now, it’s not out of season, yet. It’s beautiful! You are such a wonderful cousin. Can we meekly ask for the pattern? Some of us don’t get to the winter knitting until spring (or later)…. Aw, yes, she will love it! We can make them for next winter!!!! I like it! What a lucky little girl. What a pretty pretty hat. I love the gathered and ruched top. Your little cousin will love it. What a cute hat! Your darling cousin will love it! Please write up the pattern. I’d love to knit one for my daughter. So write up the pattern already! As others have commented, making hats – for the cold, for chemo patients, or for quick gratification and those last-minute gift needs – is really a year-round knitting choice. Besides, we have to check out your new ruched center – great-looking result! Once again, Grumperina comes through with a gorgeous new design!! What a lovely hat for a lucky little girl! 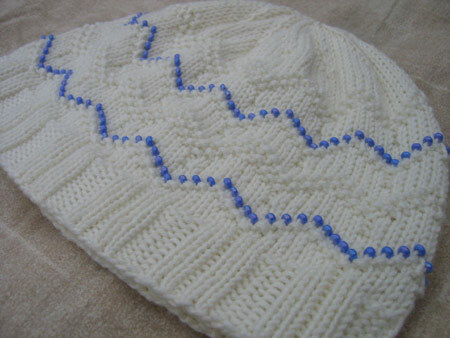 Blue and white is my favorite color combo- love the hat! Awww..very cute hat for your little cousin. She’s sure to love it! Are you saying you have the same size head as a 3 1/2 year old? (My kids have big heads, so that’s probably the case for me.) What a gorgeous hat! I think I like it better than Odessa! Very pretty. I hope whomever found the original Odessa is giving it a good home. Interesting – just after I made Odessa, I read somewhere that placing a bead on a purl stitch is very secure as it sits on the little horizontal piece, and I see you’ve used that here. Odessa is just about my favorite pattern ever – but I confess that near the top, I thought to myself, “wouldn’t it look better to squeeze one more bead into this little crevice? I wonder why Grumperina failed to do that? Not like her, at all. Oh.” I really should have known better, and implicitly trusted your directions, which I shall do henceforth.” It was necessary to travel to Lexington for the Cashsoft DK, printed-out pattern in hand. The ladies there were quite excited when they saw your photo. “Hey! She comes in here sometimes! Look everybody, it’s the Grumperina!” So you’re a celebrity! Or did you purl the bead rows? On closer look, those stitches look vertical. cares that its out of season. Adorable! The gathering/ruching is an especially nice touch–subtle, not like some ski-type hats with a big empty bubble at the top. LOST her hat? Hmmmmm…I believe it was stolen! Look for it on Ebay ;)…And please write this one up (in all your spare time! )it’s a keeper! Please do write it up! Winter is not yet over here in the Great White North and I don’t think I’m up for knitting another Odessa (three already!). Oh PLEASE write it up! It’s lovely! And as fibersnob said it’s still winter in the Great White North for another month at least, and even into May you often still need a light hat like this one. In a nice cotton blend it will work great in the frigid winter off-season. It is cruel and unusual treatment to taunt us with such a sweetly sophisticated hat and say “maybe later”!! And as a PS, I read your “100 things” and I discovered you like books about Far-Eastern culture. You might enjoy “The Hero’s Walk” by Canadian-Indian author Anita Rau Badami. I read it in my Contemporary Canadian Literature class, and very much enjoyed it – the book is centered in a small South Indian city. ok, I charted up the ribbing and the beaded pattern . . . I just need the top shaping *vbg* when you get a chance. you will leave dozens of weeping knitters in your wake if you dont write that up. it’s lovely. and a gift of love for the little sweetie. She should! It looks awesome! Great little cousin cap!… I’ve just read on Black Olive’s blog that you know all there is to know about the Ott lites. Would you consider reviewing the different ones available? I’d love to have a floor lamp, but it’s a lot of money.18w or 24 w? What’s the difference between the Ellenton and the Dover? What’s your favorite and why? Another lovely hat. It is Autumn in New Zealand and I am knitting your Odessa pattern, thank you very much for sharing. I would love to knit your new hat as well – wonderful. Yet another hat (of yours)that I love! Please write up the pattern for those of us who aren’t as talented as you. 🙂 Pretty please? Just chiming in on wanting the pattern. Love it! Of course it’s totally up to you, but I’d make it and Odessa. They’re kind of like cousin hats. I have bought my beads, just have to get the yarn. Please, write the pattern for us!! I know that the cold season in the north hemisphere is almost over, but here in Brazil it is about to start. My niece would love to have one!! I have already knit her the Odessa hat and she loved! I too hope that you write this one up. My girls would love it! We’ll have winter for at least another month where I live. Sigh. If nothing else works, maybe if I beg in Danish? Let’s see. “Åh smukke og overordentligt talentfulde Grumperina, vil du ikke nok velsigne vor ydmyge verden med mønstret til denne din fantastiske kreation i blå og råhvid?”. Mkay, so you can’t quite trust the preview.. Sorry about the huge spaces. Love that hat, as will the little cutiepie! Sure hope you share the pattern with us. I already have an Odessa in my wardrobe, but one more hat would be welcome! Love the new hat, please write it up. It’s never too early to start on the Christmas knitting. Oh please write it up! Like the rest of the folks haven’t said this enough…. So cute! It is perfect in the blue and white. Your talent truly amazes me- I’m always excited to see your new projects. Ooooh, I love the shaping at the top. I will add my plea to the din. PLEASE write it up. I need to knit a hat to wear while sailing this sping when as it’s cold on the water & this hat would be awesome!! This would be so much more fun to knit than a watch cap out of gray alpaca. The blue beads remind me of waves. It’s lovely! Pretty please write this up! I’m going on a vacation next December with my mom, sister, and kids and would love to knit it for my mom and sis. Hats are never really out of season and they make great gifts. PLEASE write it up. I knit hats year round and donate them to various charities. And this is just darling!!! Great hat! I tried going to Beadworks last time I was in Cambridge, but Alas! They were closed for new carpeting. Sigh. When I do get around to it though, I’ll go back and try one of your hats. Not out of season here in California, believe it or not! 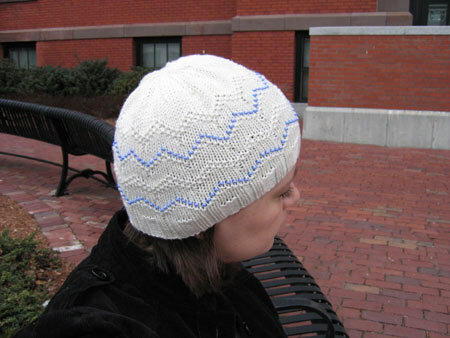 And it’s a beautiful hat…just as lovely as Odessa, so please,please share the pattern. BTW, Loved making Odessa. Thank you for sharing it with us! Please do write up the pattern! I don’t care that it’s unseasonable — I’m not much of a seasonal knitter, anyway. It’s gooorgeous and I want one. Luen er nyyyyyydelig! Jeg trygler og ber på mine knær, vær så snill…. 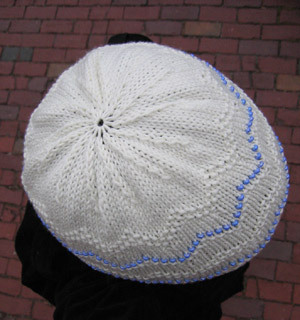 please write up this hat pattern it is a must have I love it…. I concur with the very first comment about it being a great chemo hat! So please write it up. =) I have knit my sister Odessa sans the beads for one of the 5 or 6 chemo hats I’ve made her. I’ve yet to send it off to her, but I will get a picture of it.